Buy A Painting! 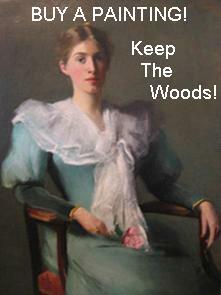 Keep The Woods! Adelaide Fine Art of Darien and Stonington, CT will be featuring fine 19th & 20th C. American Paintings for sale, March 21-April 14, at Patriot National Bank, 800 Post Rd. Darien. A percentage of all sales from the show will be donated to The Campaign for Ethel Walker Woods, a Trust For Public Land project in urgent need of private funds to save 424-acres of meadows, forests & wildlife in Connecticut. Join us Wednesday, March 21, 5:30-7:30 p.m. at the Darien Patriot National Bank for this special opening. Buy a painting, and help save this large piece of open land in Connecticut forever! The Campaign for Ethel Walker Woods is committed to conserve and permanently protect 424-acres of lush meadows, forests, wetlands, streams, and floodplains in the heart of more than 1,400 acres of continuous open space in Connecticut. Its rich and exceptionally diverse wildlife habitat is in immediate danger of being subdivided and developed if the necessary private donations are not secured. The acquisition of the Ethel Walker Woods is a two-phase project, with The Trust for Public Land committing to raise nearly three million dollars in private donations by March 31, 2007 in order to close on Phase I. All donations are tax deductible to the fullest extent allowable by law and may be made in the form of cash, credit card gifts, and appreciated securities and stocks. If you have any questions, please contact Melissa Spear at 203-777-7367 ext. 2 at The Trust for Public Land, 101 Whitney Ave., 2nd Fl., New Haven, CT 06510. For further information see www.keepthewoods.com. Thank you for your support of this important conservation project! Ann Marenakos, owner of Adelaide Fine Art, has been selling American paintings for over 20 years. After many years as a Partner at Quester Gallery, she has become a private art dealer focusing on buying, selling, appraising, and conserving paintings for individuals and corporate art collectors. "My focus is on selling American paintings of a variety of subjects including landscape, seascape, marine, sporting, figurative, and floral. I offer a wide range of major and lesser-known artists, most of whom were active from 1875-1950. I assemble special offerings, wonderful collections of Post-Impressionistic paintings, Women Painters, Cape Ann School, and other beautiful things. I have always been known for excellence in quality and fairness in price. I am dedicated to my valued clients and stand behind everything I sell. I will search for specific items of interest and keep an active "wish list" for collectors", said Ms. Marenakos. Adelaide Fine Art is open by appointment and has a viewing gallery in Stonington, CT. Call AFA at (203) 662-0244 or visit www.adelaidefineart.com for more information. Ann says, "I sell what I love. I offer a unique collection of paintings filled with that which Robert Henri lovingly referred to as, "the art spirit". Glimpses of life and its beauty captured for generations to admire. I advise my clients to buy paintings that move them and have personal meaning. Living with fine art adds such joy to one's life. Secondly I advise collectors to buy the best they can reach for in a collecting category. The artist, the subject matter, the quality and the condition of a painting have a tremendous impact a painting's long-term investment potential."